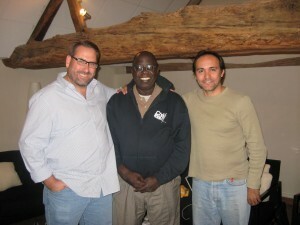 (from left) Neil Cole, Mboi Andre, and Walter Testa shared vision and enthusiasm for church planting and expansion with CHARIS leaders meeting in France. Three gifted, apostolic church planters shared their vision and hearts for expansion of the gospel with the CHARIS group meeting this Wednesday afternoon at the Chateau St. Albain. Mboi Andre, executive director of the union of Grace Brethren churches in the Central African Republic, reported on the 54 churches recently planted and explained his strategy for expanding the gospel to the north and east of the central African country. Walter Testa, an Argentine who works with church planting and expansion in Mexico City, shared his vision for 100 church-planting families and for the planting of a missionary couple in every state of the country of Mexico. And finally Neil Cole, of Church Multiplication Associates, shared how God is using CMA and its associates in planting organic churches all over the world. The purpose in having the three present was to expand the vision and thinking of the CHARIS leaders about evangelism and church planting for the decade ahead.